As I arrived there, I just dropped my luggage quickly and rushed at Ramana’s ashram. While walking on the soil, I felt like a huge wave of emotion taking over me. I was realizing that Ramana had put his feet on the same place… I was just seeing him walking here!!! What an emotion… I managed to reach the back of the ashram without crying but that was not far. At the moment I went through the back door, and I saw the beautiful path on the mountain, I just started to cry and fell in tears not really knowing what was happening. Those were my first moments here. The ashram is truly such a peaceful place ! I wanted to walk on It. I have been blessed to go to the top for the last day of the Kartikai Deepam festival where the sacred fire of Shiva is simulated and burns the whole night long. During the walk to the top, the rain fell heavily for a while. It was like huge cleansing happening and even if we were cold, the walk was very easy, like if carried by Arunachala. That moment is still within me. It is when I had the chance to walk on the inner path that something very deep and peaceful happened. I was just like at home. Everyone I love was with me. That was obvious. I was just at home. Just as if Arunachala was only here for me and me alone. Without any sense of possessiveness but more a sense of aloneness. Just Arunachala and Me. I had not desire of speaking. There was nothing happening at all. Nothing huge. Nothing small. Nothing. I fell so much Life. Arunachala is so much alive !!!! Like a Mother caring about her children. Like a Mother feeding Life. While meditating there, I just got the sensation I was absorbing Arunachala within me. And now, It is within. I can call Her at any moment, She is definitely here, within. I know that I am in the Heart of Arunachala. 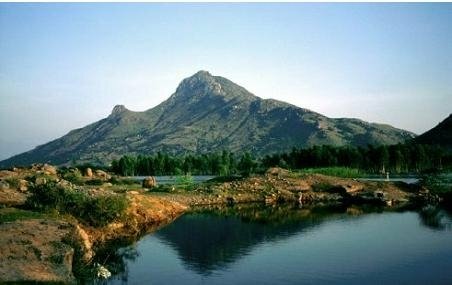 I know that Arunachala is in my Heart. It is as if Arunachala has absorbed all, even Ramana… How is it possible ? I WISH TO DISSOLVE MY” self “IN ARUNACHALAM. I felt all of your moments in that sacred place, i’m sure that is is so strong and so full of LIFE, as it should be. BEAUTIFUL. I HAD A SIMILAR EXPERIENCE IN ANOTHER PART OF INDIA. I WANTED TO HUG THE EARTH WHICH WAS FULL OF CRISTALS COMING OUT OF IT. I GUESS THAT LOVELY COUNTRY IS BLESSED IN MANY PLACES. How blessed all these people! !Great are their experiences.